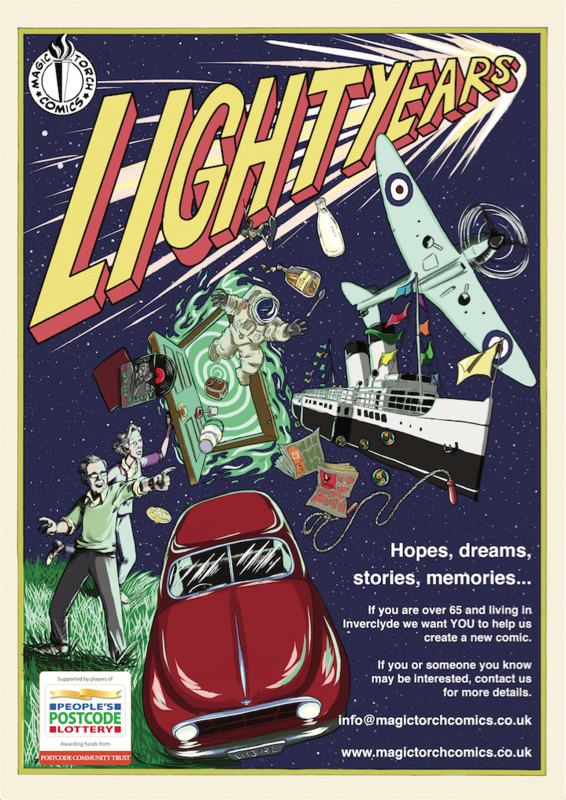 We are delighted to announce that our Light Years comic project has received £7250 of funding from players of People Postcode Lottery through Postcode Community Trust. The project will work with a group of people from the Inverclyde area to create a new comic exploring hopes, dreams, stories and memories. So, if you, or someone you know is over 65 and would like to be involved in creating this comic - please get in touch for further information. The sessions for the project will run in Greenock and Port Glasgow later this year, and be free to access thanks to the support of Postcode Community Trust. We'll be sharing our progress on the blog as the project develops over the next few months. The Light Years comic will then be launched in March 2018 and be available at Greenock Comicon and on World Book Day. For an idea of how our comic sessions work, why not have a look at this video exploring our Domate Comic Project, which was recently delivered with Notre Dame High School Communications and Language Department.